Awww! 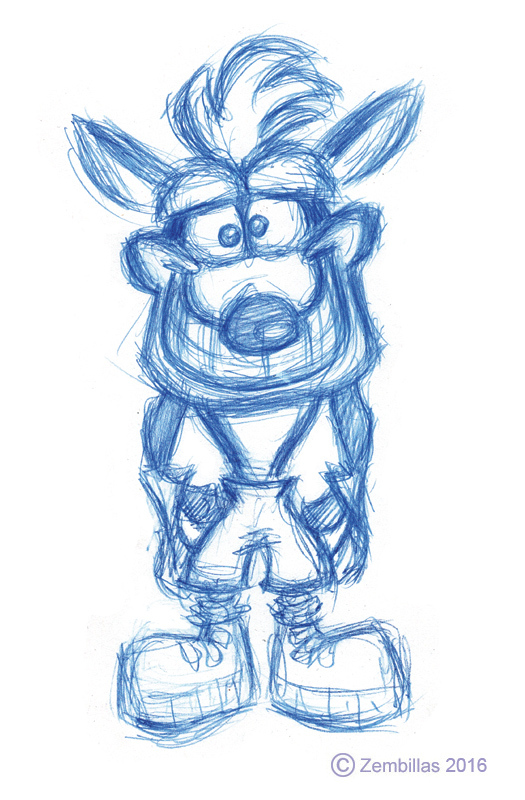 Starting off the weekend with crashing a Crash drawing! You draw Crash like a pro! Vanilla Latte yes Crash is weird to draw. Strange character to master. Makes it fun. Hazman the url you posted is a dead end. Try again and I'll take a look. Your character sketches are good Hazman. I suggest paying a little more attention to construction in certain places. I place a lot of emphasis on construction and making sure that everything is articulating properly. For example the ellipse of the eyeline and also the centerline. Those are important fundamental aspects of character design. Spend a bit more effort with each drawing for a better feel of a completed sketch. Keep practicing. You're going to see further improvement in your work as a result. Good luck! Thank's Charles! Yeah I do sort of struggle a little bit when trying to find the construction or posture for the characters that I work on. I can imagine how the characters look and act but it's still some thing I need to practice more on. Eye's are exactly what I like to experiment on. what on all sorts of shapes and sizes. do try some different techniques with team to make the character look more unique. and the eyes are the gateway to the soul of the character. And eyebrows to. But yes it a good idea to make some volume for the eye's a round the face so it look's right. Maybe I'll do some thing like this again but more in a study drawing. thinks for the tips. I'll keep this in mind.